Chinese National Day. Tien An Men parade. Tien An Men Square Pecking. National Day, October 1. Chinese National Day. 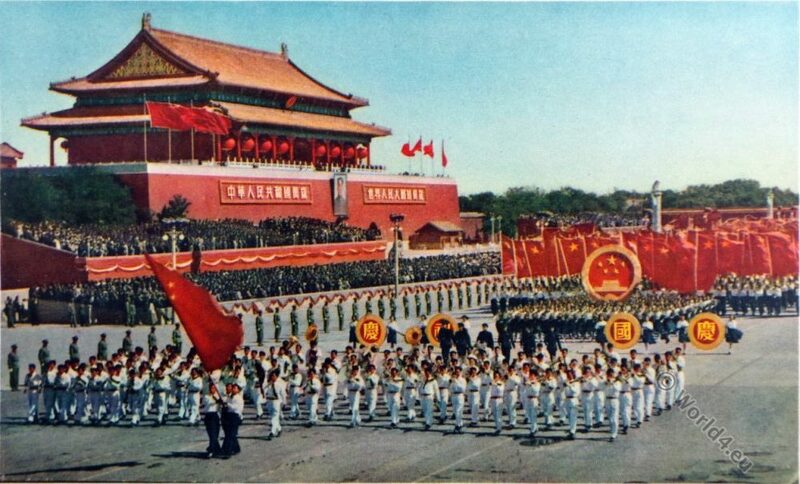 Tien An Men parade 1954. This entry was posted in 20th Century, 50s, Asia, China, Genre and tagged China scenery on 10/12/16 by world4. Chinese propaganda at the time of Mao Tse Tung. This entry was posted in 20th Century, 50s, Asia, Mongolia and tagged Traditional Mongol costumes on 1/3/16 by world4. Mongolia school boy under Chinese Communism 1950s. 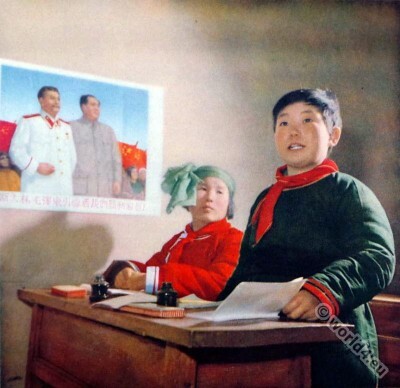 Mongolia school boy under Communism in 1950s. 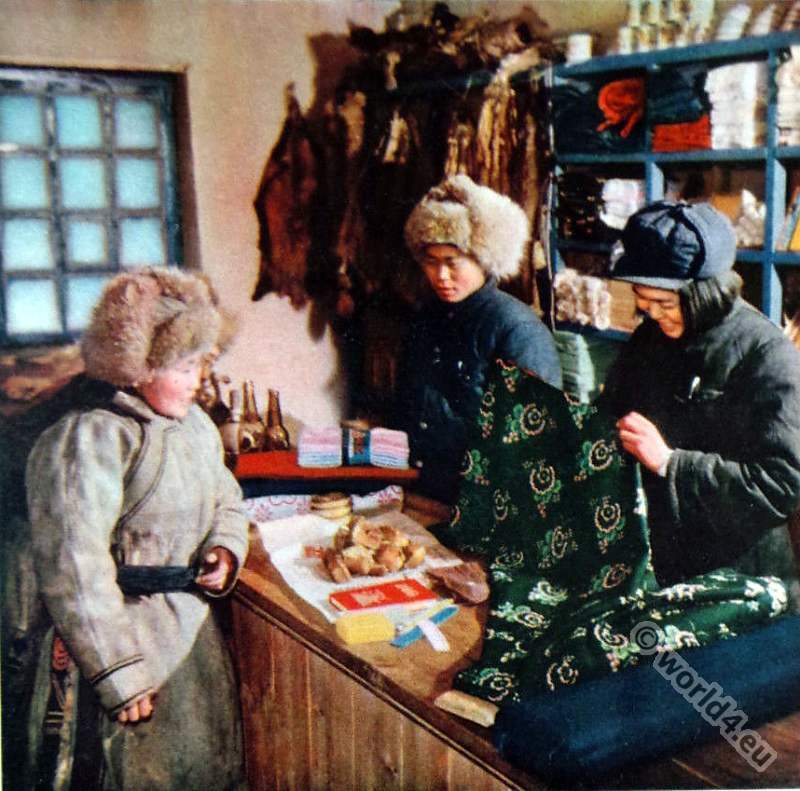 This entry was posted in 20th Century, 50s, Asia, Child, Mongolia and tagged Traditional Mongol costumes on 12/23/15 by world4. 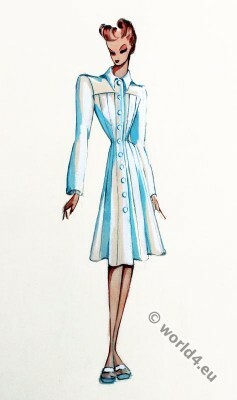 Costume design by Marie-Louise Bruyère in 1950s. 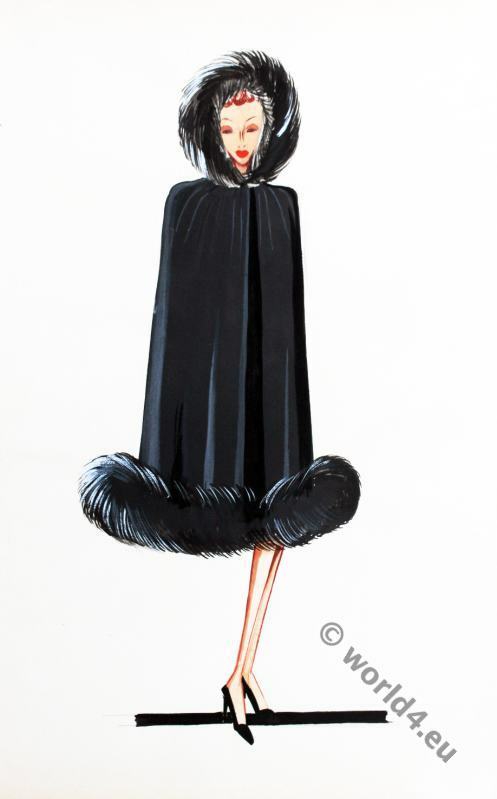 Costume design by French couturier Marie-Louise Bruyère. Marie-Louise Bruyère (1918-1958), called Mme Bruyère (pronounced Broo-yair) was born in rural France, but her ambitious parents, Henri Bruyère and Jeanne Loubet, moved the family to the expanding suburbs of Paris, where they prospered. The sophisticated neighbourhood of Saint Gratien, which included Napoleon I’s niece, Princess Mathilde, amongst its residents, impressed the young designer who trained first with the house of Cheruit, and then Lanvin. 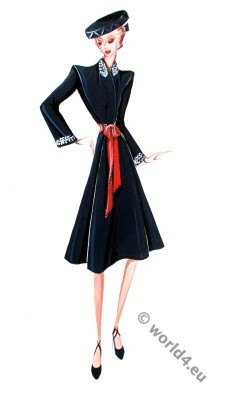 Madame Jeanne Lanvin asked her to become Première d’Atelier de Couture. By 1928, she opened her own fashion house, Bruyère Couture, which flourished as her fame spread internationally, allowing her to open a grand salon at 22 Place Vendome in 1937. 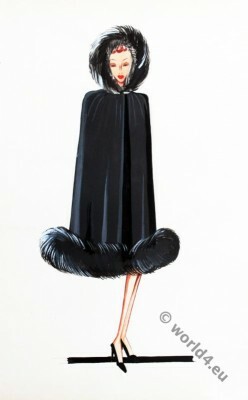 She staged two fashion shows a year, containing up to 200 different outfits in cool raffish elegance. Each outfit was assigned a different name. By 1947 she employed 328 people. 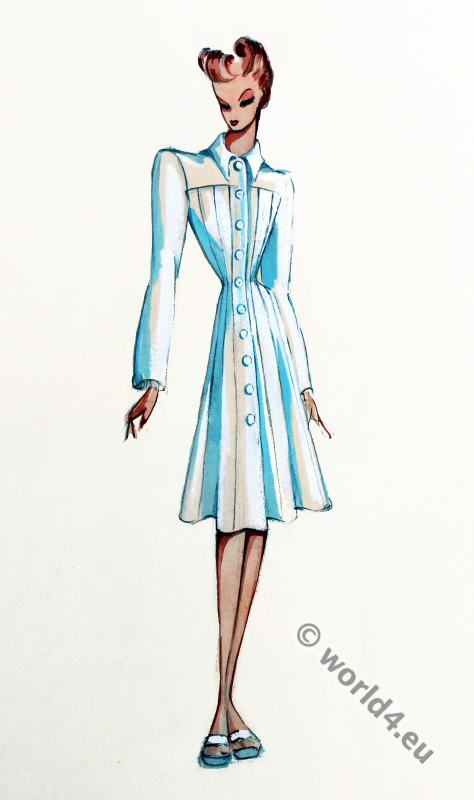 The business continued to grow in scale and reputation, but from the mid 1950s it switched to producing prêt-a-porter outfits, and its name became increasingly eclipsed. This entry was posted in 20th Century, 50s, France, Haute couture and tagged Couturier, Haute Couture Costumes on 1/27/15 by world4. This entry was posted in 1750, 18th Century, 50s, Fashion History, Rococo and tagged Movie, Rococo fashion on 8/9/14 by world4. 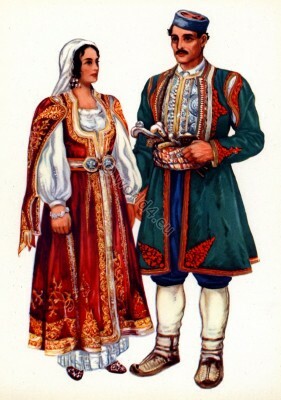 Couple from Risan in traditional Montenegro national costumes. Couple from Risan Montenegro. (Crnogorska narodna nošnja). The traditional garb of Montenegro is considered one of the finest in Europe. This entry was posted in 20th Century, 50s, Montenegro, Serbia and tagged Embroidery designs, Montenegrin national costumes, Vladimir Kirin on 9/6/13 by world4. This entry was posted in 20th Century, 50s, Hairstyle and tagged Movie on 6/10/13 by world4. 1950s Fashion show on glasses. The models appear in different wardrobe, adapted to the glasses models. Wonderful 50s hat fashions, costumes and makeup in the trendy colors. Pearls of elegant appearance. This entry was posted in 20th Century, 50s and tagged Movie on 5/25/13 by world4. German boys fashion in the 1950s. 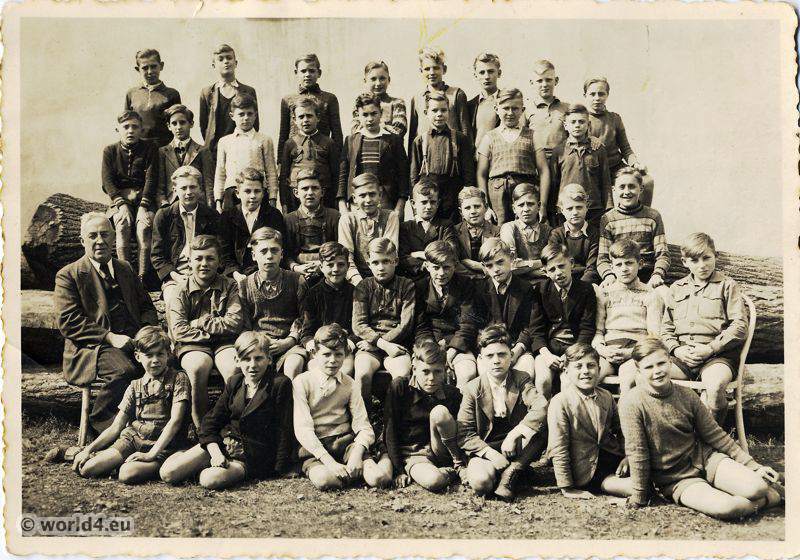 German boys school class 1948. German boys school class with teacher 1948. 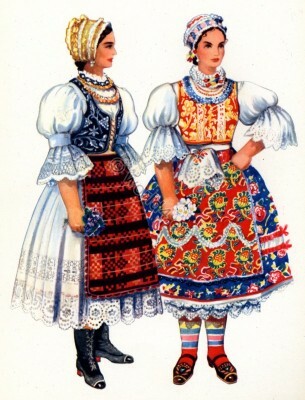 Fashion in German post-war period. A fine example of the common fashion in the German post-war period 1950s. Shown is a boys school class at school or hiking trip. For this reason they are dressed very practical and spruced. The hair is worn very short, the ears are free, plus a side parting. Waistcoats and jackets, a white shirt, a vest over a sleeveless sweater. Many of the boys wear short pants. The boy left a leather pants with matching suspenders. The teacher wears a jacket, including a vest, white shirt and tie. The pants are cut wide and striped patterns. This entry was posted in 20th Century, 50s, Child, Germany and tagged Children Costumes on 4/18/13 by world4.